While I was searching the web to find a suitable, reliable and trustworthy online casino that accepts US players like me, I came across Bovada Casino, an excellent online casino that met my criteria. The casino is well-established and has long and good reputation in the online gambling industry. From what I read, the casino is derived from Bodog Casino which is one of the biggest online gaming brands. It is one of the five online gaming sites owned by Morris Mohawk Gaming Group and it uses Betsoft Gaming, Real Time Gaming and its own proprietary software to power the casino games. Bovada Casino is licensed in Kahnawake and besides online and mobile casino games, it also offers online gambling sectors for poker and sports betting. I was also glad to see that the casino accepts American players so I knew that this is the best online casino destination for my needs and taste. Two of my top criteria for signing up with an online casino are to find a casino that accepts players from the US and that offers a great selection of blackjack games. 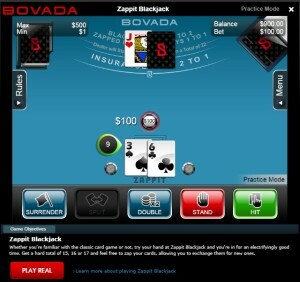 A blackjack fan like me always likes to experiment playing various blackjack variants so I was happy to see that I could play some superb titles at Bovada Casino like Single and Double Deck Blackjack, European Blackjack, Face Up 21, Match Play 21, Pontoon, Super 21 and a new blackjack game I haven’t heard about before called Zappit Blackjack. Moreover, I could play the games in practice mode so I immediately played a few sessions of each blackjack game. What really made me happy is that the casino offers game intro, tips, rules and description of each game available including a few general informative articles about standard blackjack which is excellent for players that are new to the game. Blackjack games are not the only games available at Bovada Casino. Since the casino is powered by a few software providers there is wide game library comprised of diverse online casino games that can be either downloaded or played instantly via a web browser. Besides table games like Craps, American Roulette, Tri Card Poker and Let Em’Ride, I came across over 90 various slots, about 20 different video poker variants, more than 50 progressive jackpot games and about 10 specialty games. The 3D slots from Betsoft Gaming software caught my eyes and I spun the reels of Lost, At the Copa and Mr. Vegas. I also like to play video poker from time to time so I checked some titles like Jacks or Better and Joker Poker. I liked some of the progressives such as Greedy Goblins, Slots Angels, Good Girl Bad Girl etc. I was also happy to see that Bovada Casino offers two blackjack exclusive promotions- Blackjack Weekends and Table Mania Tuesdays. According to the rules of the first promo, for every 200 comp points I earn playing blackjack from Friday to Sunday I get $10 bonus casino chip and up to $100 in bonus chips every single weekend. The second promo refers to playing blackjack, roulette, craps and baccarat and for every wager of $250 on any of the table games every Tuesday I may be given $10 casino ship the following day. I also saw that Bovada Casino offers $3,000 casino welcome bonus to new players. The great news is that I can redeem each bonus code up to four times. The bonus amount for slots is 100% match bonus up to $500, while for other casino games it is 100% match bonus up to $250. Furthermore, the fans of video poker can play the games and earn $52 cash bonus as well as a share of $5,200 in weekly draw prizes. The casino also rewards mobile casino players and they can get a $10 chip the first time they join the mobile casino experience. Last but not least, the VIP Red Room is the next level service exclusive for VIP players and they get special treatment, additional benefits and many more red carpet perks. Things got even more exciting when I found out that Bovada Casino is also available on Mac computers as well as on the move on iOS and Android powered mobile devices. 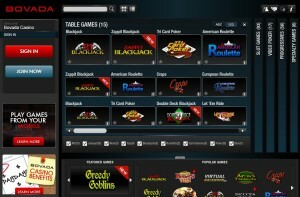 To get access to the games on my iPhone, I visited the casino from the Safari browser and logged in. To join the mobile casino you can also scan the provided QR code. Luckily, I could play any variety of blackjack as well as games like At the Copa, European Roulette, Baccarat, Crystal Waters, Dirty Martini Bonus Deuces Wild and dozens more. I’m familiar with the rules and regulations regarding online gambling in the US and I know it is not possible for a US player to make a deposit to an online casino via an e-wallet or bank transfer. However, I know that I can use some credit cards to make deposits and withdrawals as well as Money Transfer or Rapid Transfer, therefore, I was more than glad to see that Bovada Casino offers these banking options. The limits of the banking methods are listed at the cashier. You will be charged 4.9% on credit card deposits, and maybe more depending on your card carrier, so be mindful of that. Moreover, there is an entire article explaining USA online casinos to US players and how they can make payments which is quite informative. In addition, there is enough info on how to ensure you get your casino payout fast. To learn more, visit the casino. I must admit that Bovada Casino satisfied all my criteria for choosing a safe and reliable US online casino. The casino is legally licensed, has top notch security, 24/7 customer support (although no live chat support), uses software from excellent software providers, has superb selection of blackjack variants, mobile casino, offers suitable and US-friendly banking methods and bankroll boasting bonuses. The casino is simply excellent online gambling destination for all US casino players, but you won’t have much joy if playing from elsewhere as they don’t accept any other nationality.